Plumeria is a genus of flowering plants in the dogbane family, Apocynaceae. It contains primarily deciduous shrubs and small trees. They are native to Central America, Mexico, the Caribbean, and South America as far south as Brazil but can be grown in tropical and sub-tropical regions. Plumeria is related to the Oleander, Nerium oleander, and both possess an irritant, rather similar to that of Euphorbia. Contact with the sap may irritate eyes and skin. Each of the separate species of Plumeria bears differently shaped, alternate leaves with distinct form and growth habits. The leaves of P. alba are quite narrow and corrugated, whereas leaves of P. pudica have an elongated shape and glossy, dark-green colour. P. pudica is one of the everblooming types with non-deciduous, evergreen leaves. Another species that retains leaves and flowers in winter is P. obtusa; though its common name is "Singapore," it is originally from Colombia. Plumeria species may be propagated easily from cuttings of leafless stem tips in spring. Cuttings are allowed to dry at the base before planting in well-drained soil. Cuttings are particularly susceptible to rot in moist soil. 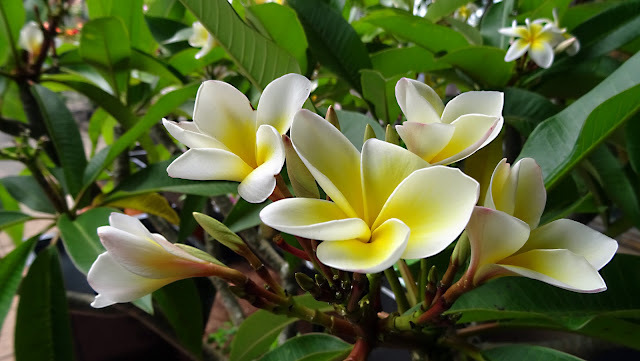 In order to get the most from a plumeria plant with respect to growth, size, blooms, and scent, there is a fine balance that must be maintained. Ideally, a plumeria is in its element when it can have plenty of sun and appropriate water, so as to maintain soil moistness just above a state of dryness. On the other hand, if the plant receives a lesser amount of sun, then a lesser amount of watering is necessary - again, to ensure that soil moistness stays just above the dry state. The more sun, the more water. The less sun, the less water. A common mistake of novice plumeria growers is to overwater the plant when it is not able to be exposed to enough sun, thereby resulting in a rotted root system. Conversely, if a plumeria plant is able to receive maximum exposure to the sun, but they aren't watered enough, the plant will die. Those flowers are so lovely - I tried to grow them as a house plant, but unfortunately thay didn't survive. I'm looking forward to smelling these lovely flowers in Maui. My 1st thought is Brisbane where we lived for 6 years before returning to Tasmania 10 years ago. I fondly remember the Frangipani trees growing everywhere. They are just so beautiful when in flower. A friend gave us a piece she just cut from the end of a branch. We stuck it in the ground & it grew, it was that easy to propagate. Out of curiosity I just Google Street viewed it to see how big it's grown & they've done away with the front garden, Frangipani included. It had such a lovely front garden now it looks like an uncared for mess. Such a shame. Exquisite photo of an equally exquisite flower. My mom used to grow these outdoors in South Florida in the US. Thank you for this great information. I have always loved plumeria for its scent and did not know any of this information. Your photo is lovely! So stunning - they look like porcelaine! Like a yellow yolk .. so pretty! Dear Nick, I wish you a merry christmas and an happy new year! Wonderful flowers in your fantastic photo. Thank you for FLORAL FRIDAY FOTOS! More then beautiful !! One of my favorite flowers ever!! I really love these flowers. Merry Christmas and a happy New Year, dear Nick! Have wonderful holidays. I have plumeria-scented lotion, but hadn't known its petals were that pretty! I forgot to mention, do you know why it's called frangipani? It means "french bread." It's because the branches when they drop their leaves do look like baguettes! Plumeria is such a beautiful flower and the point you made about them being more fragrant at night to attract the sphinx moth is very interesting. Thank for the informative post and for hosting Nick! Never Seen before... A beautiful Bloom. Wish you a Merry Christmastime! I wish you and your family a Merry Christmas and a wonderful New Year !! We will meet again between the beautiful flowers. I wish you a Merry Christmas and a happy new Year, dear Nick!